RockUnitedReviews: PHI: "Now The Waves Of Sound Remain"
PHI: "Now The Waves Of Sound Remain"
Art-Rock from Austria? 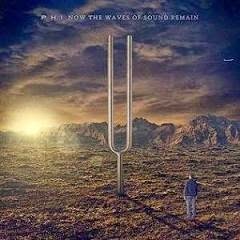 The power trio of PHI are signed to the label owned by RPWL (Gentle Art Of Music) and "Now The Waves Of Sound Remain" is an album that sprawls across many different genres and styles. The songs are generally slow, atmospheric, dark, and rather moody. They have that Tool meets Rush meets Alice In Chains meets Porcupine Tree sort of sound going on and they are certainly groovy and progressive at the same time. Lengthy passages and power drumming are merely to be expected as the three continues to explore the boundaries of rock on their second album release. They have clearly set themselves an agenda to be as quirky and arty as possible, unfortunately not always blessed with clever song material though. In fact. Their sonic tapestry might just be a tad too invert and dare I say boring to please this particular reviewer. The structure of their arrangements are mainly if not solely focused on the band instead of the actual listener a.k.a. buyer of their product. It's designed for a reaction of the extremes at the dark and moody side of Prog/Math. Music intended to upset the listener? as the compositions are either stuck at second gear or simply just not going anywhere. Some of the time-changes and breakdowns are darn interesting though and it's clear that months of effort have gone into 'Now The Waves Of Sound Remain'. The title track is also something to build on for the future (10+ minutes of Progmageddon). Nonetheless. It's sadly just not enough to keep us interested in the long run. CHRIS DUARTE GROUP: "Lucky 13"
EVERGREY: "Hymns for the broken"
Billy IDOL: "Kings & Queens Of The Underground"
GRAND DESIGN: "Thrill Of The Night"
CELEBRATING Jon LORD: "Various Artists"
KORIA KITTEN RIOT: "Rich Men Poor Men Good Men"
John TAGLIERI: "Days Like These"